It was with heavy heart that I donned my Abzan clan shirt and pins as an act of defiance towards the events of the Tarkir block in Magic: The Gathering’s latest series of expansions. Dragons have returned from extinction to the plane of Tarkir thanks to a time traveling meddler named Sarkhan Vol, and while good has come from it, the five clans of the plane have been put down and replaced by dragon broods. 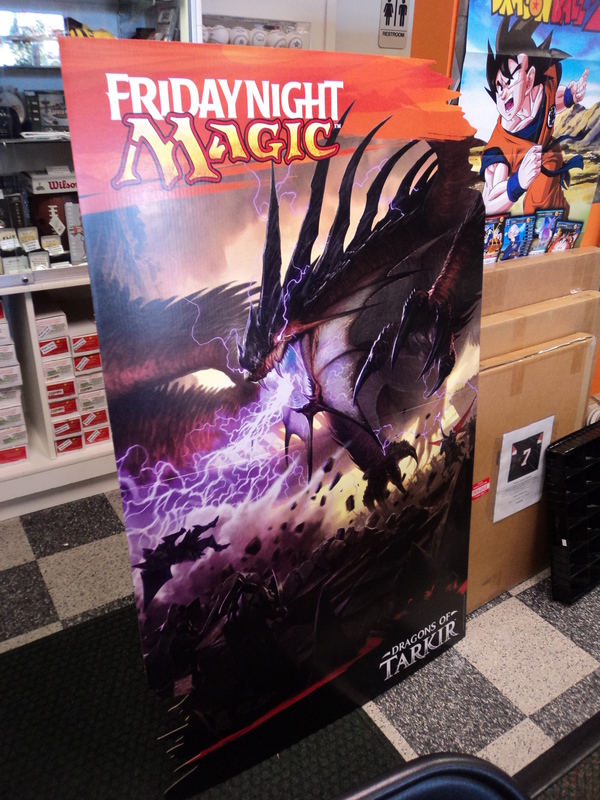 A cardboard standee advertising the Dragons of Tarkir expansion and Friday Night Magic events at hobby shops. At the Khans of Tarkir and Fate Reforged pre-releases, I wore my shirt, a gift from a friend, to show allegiance to the clan associated with green, white, and black mana on Tarkir, the Abzan. They’ve been replaced by the Dromoka brood, who’ve stomped out any and all use of black mana. The same has happened with the Jeskai, the Sultai, the Mardu, and the Temur. The dragon broods of Otujai, Silumgar, Kolaghan, and Atarka respectively removed all traces of the “enemy colors” of each clan- the red/white/blue Jeskai becoming blue/white, Sultai changing from green/black/blue to a simple black/blue, Mardu being reduced to red/black from red/white/black, and the Temur succumbing to animalistic forces, losing their blue mana links to become green and red exclusively. 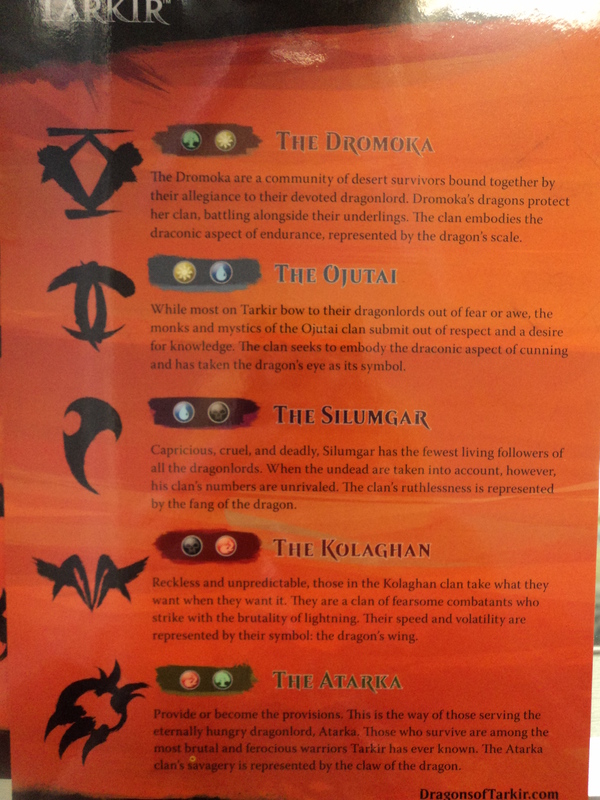 The names, symbols, associated mana, and description of the dragon broods of Tarkir. If you’re a fan of dragons, there’s plenty to like in this set from an art and story perspective. If you’re like me, you’re less interested in the depth of five fictional societies based on historical cultures from the previous Tarkir sets being reduced into caricature due to the new Dragonlords. The first five legendary creature cards to bear the Elder Dragon types in years, they’ve conquered the humanoid races of Tarkir and forced them into servitude. We have yet to see the full story, and whether this will continue to be portrayed as a bad thing, but there are dragons everywhere on the cards themselves. However, there’s only about twenty-six cards in the 200+ card set that have the word “dragon” in their typeline, exclusively at uncommon rarity and above. While there are cards that care about dragons at common, it’d be a bit of a letdown for a newbie to only pick up a couple of packs of a set called Dragons of Tarkir, and not get any dragons. Multiple people have reported opening up their five packs of Dragons of Tarkir during the sealed pre-release event, including the special “seeded” booster, and not getting any at all. For my part, I got five dragons out of the seven packs I opened on Saturday during the event- three from Dragons of Tarkir packs, one from the sole Fate Reforged pack in the pre-release kit, and one from my participation prize pack. 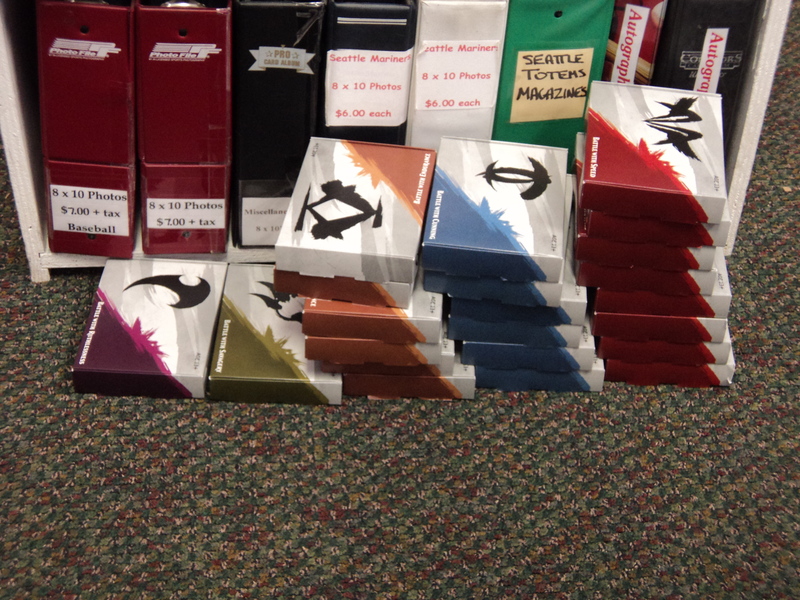 A stack of prerelease kits for Dragons of Tarkir. Each box holds six booster packs, a 20 sided die, an activity page and a lore/deckbuilding guide. Due to my bias against Dromoka, I decided not to pick green/white for the prerelease event. Instead, I went with the red/black Kolaghan brood- their brood master spared the leader of the Mardu, Alesha in the past, and I was willing to give them a shot. One of the promotional foil date stamped cards from the Dragons of Tarkir prerelease, and one of the five dragon brood associated spindown life counter dice. In my kit, I was given six booster packs, an activity sheet, a piece of paper describing the Kolaghan brood and how to build a deck around them mechanically, and a beautiful translucent pinkish purple twenty sided die with glitter in it, representing the lightning of the red/black dragons. Loathe as I am to admit it, Wizards of the Coast went all out with the five spindown life counter dice- each intended to be the color of a dragon brood’s breath. 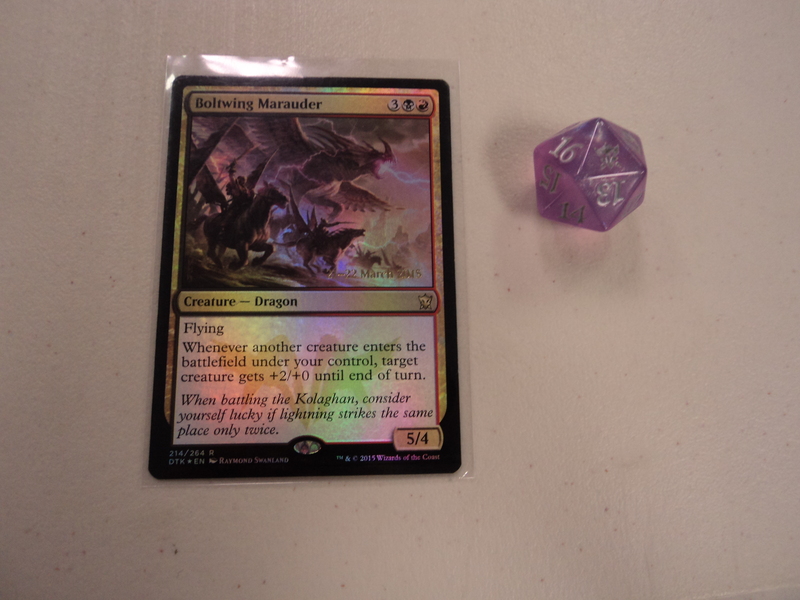 The theme continued with the prerelease activity, Tarkir Dragonfury. 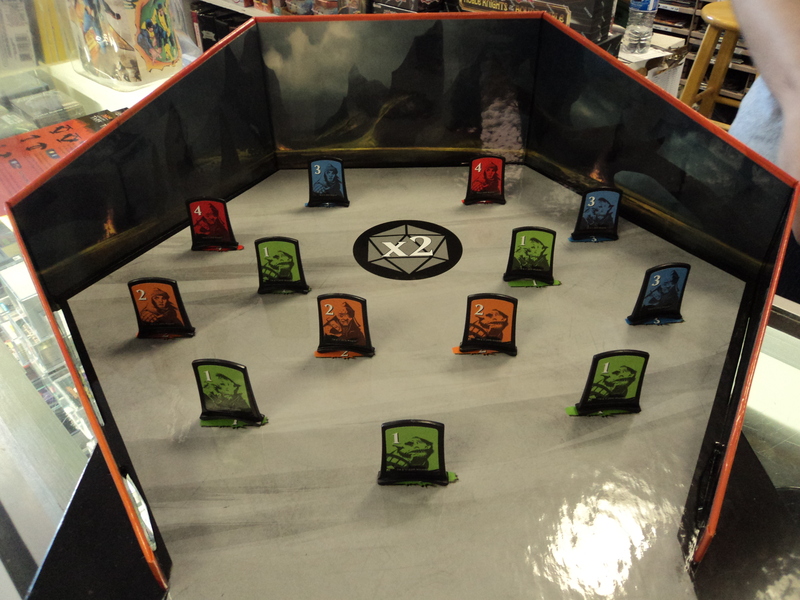 A goofy little diversion that you could participate in before the event, between rounds, and afterward, you tried to knock down little standees on a board with your dragon breath die- you are intended to be a dragon smiting humanoids of Tarkir in this silly sideshow. If you score a high enough amount of points, you get promotional cards with alternate art, with up to four different cards as prizes depending on how well you roll the die. The gameboard for Tarkir Dragonfury at the Dragons of Tarkir prerelease. The card promos continued in the packs contained in the prerelease kits- while four of the packs were just ordinary examples of Dragons of Tarkir, and a fifth was from Fate Reforged, the sixth was a seeded pack loaded with cards that skewed towards the colors of your dragon brood. The seeded pack also came with a foil promo card with the date of the prerelease stamped on it. My promo was Boltwing Marauder- a decent card that I didn’t get to use often enough. 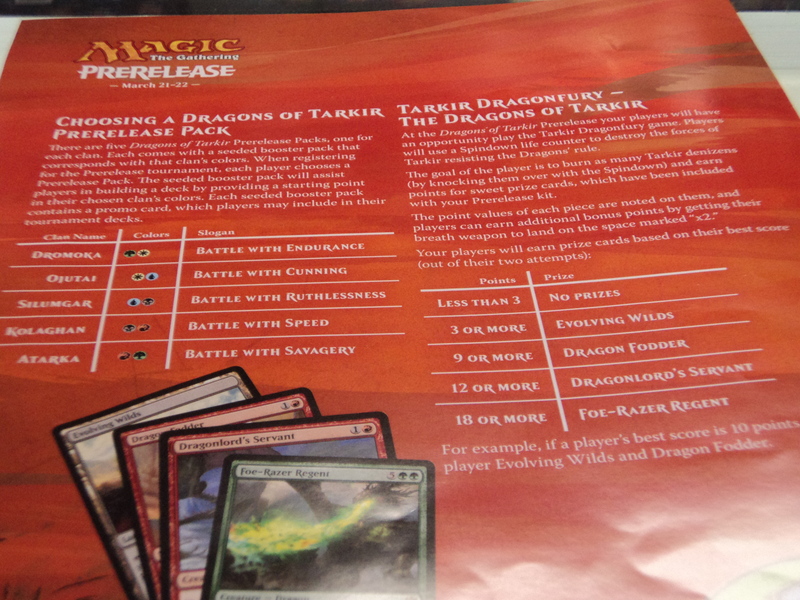 An advisory sheet explaining the Dragons of Tarkir prerelease packs and the rules of Tarkir Dragonfury. When I play as green and white, I hate “removal” cards- I’m trying to build up an army of creatures, and other decks try to take them away. When you’re playing against green/white, you learn to appreciate the value of removal. I tried blitzing through my opponents’ defenses as quickly as possible, being smart about where or when to eliminate threats. Of course, the problem was that other decks had removal, too. There were quite a few cards I wanted to play but couldn’t thanks to spells like Duress plucking them from my hand, and my creatures ended up dying to spells like Flatten. Dragons of Tarkir definitely has more/better removal than the last few sets that have come out, almost certainly to deal with the dragons themselves to prevent them from being too oppressive in the format. I did have removal spells of my own, and I managed to eke out a couple wins through some smart plays. However, I also lost a couple of times, a disappointment that occurred more from not getting my land cards to generate mana and actually play my cards. I had the right amount and proportion of land in my deck, I just never drew most of them because of their position post shuffling. I couldn’t go fast enough to tear down the green/white/x color decks I fought, because I just couldn’t get the resources for it. The lack of mana color fixing was a bit disappointing in comparison to how smoothly three color decks ran in Khans of Tarkir. I wish that the sets had mechanically gone from an enemy color pair theme to a “wedge” three color theme instead of from wedge to allied colors- losing things is just lousy, and Magic’s already had so many allied color themed sets in the past. 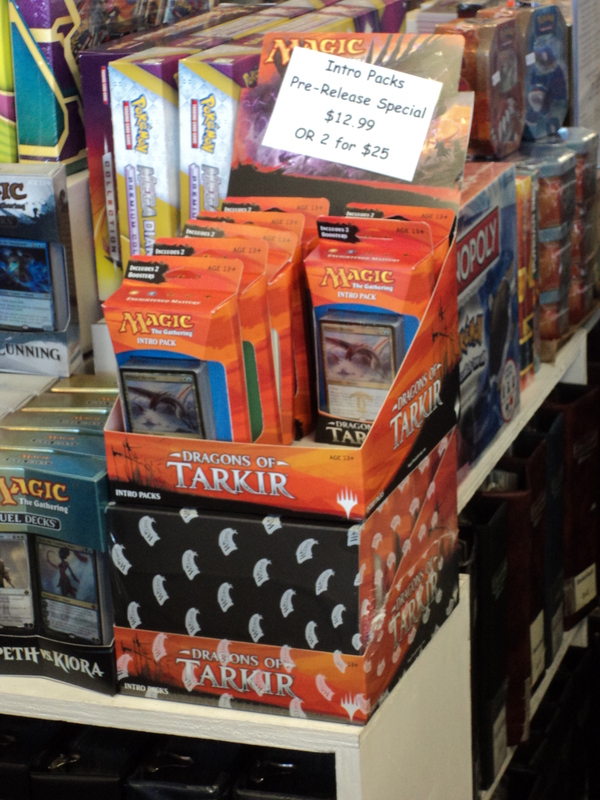 An in-store display for the Dragons of Tarkir intro packs at the World of Collections DTK prerelease in Edmonds, WA. I can’t say that the set is necessarily mechanically poor, however. The Dash mechanic of Kolaghan and its enablers in red and black won me the couple of games I did wind up victorious in. The ability to play creatures on a different turn from their standard casting cost’s requirements and attack with them before sending them back to your hand at the end of turn allowed me to avoid some drawbacks attached to their cards, like life loss or mana requirements for hard casting. The Ojutai mechanic Rebound, brought back from the 2010 set Rise of the Eldrazi, was extremely interesting to play against. Having to deal with a spell twice but knowing it was coming back again forced me to make some unconventional plays to come out on top. The Exploit mechanic of Silumgar is a strange mix of Evoke from the 2007 Lorwyn block and Devour from the 2008 block Shards of Alara, letting you sacrifice a creature when the creature enters the battlefield in exchange for a card dependent result. Dromoka’s Bolster mechanic builds up an army of small creatures, making them deadlier. Trying to beat the clock on the opponent’s bolstering and +1/+1 counter related enablers is a very tricky race to run. The faction agnostic mechanic Megamorph allowed for people to smooth out their mana and actually play something, letting you play creatures face down as a 2/2 colorless creature for three mana of any color. When they flipped up, they got a +1/+1 counter. I’m disappointed that the design space of non-creature Morphs touched on in the Future Sight block from years past was barely broached, barring Obscuring Æther. The guessing game of playing against Morphs was at least somewhat of a nailbiter, trying to figure out what was underneath the disguise and how strong it was going to be when it flipped up. I did not get a chance to see what the Atarka Formidable ability word could do in a proper context, and couldn’t judge it accordingly. On the surface, it seems very dependent on having either one big creature or a fair amount of small creatures, both difficult to maintain. All in all, I had a good time with friends, even if I have my reservations about the set. I’m interested to see what decks I end up building with the cards I got, and how I’ll modify the decks I already have built. I can also safely recommend World of Collections in Edmonds, WA as a safe environment to play Magic as a transgender woman, even if some of the younger and rowdier folk at the event grate.